​In 2015, I heard of a crowd funding effort to support an upcoming documentary about film music. I was intrigued and immediately looked for more information. I could tell that the film makers were young. They could probably even be considered inexperienced, but the thought of a full-length documentary on the music I love… I had to donate. I’ve followed the production closely ever since. About a year went by, and I found myself wondering just what level of production would result from this venture. Then, a trailer came out and my question was answered. This answer was most satisfactory. Somehow, they had secured interviews and behind the scenes access from major figures in the world of film music. We’ve seen snippets of this world on home video extras and short videos on Youtube. But, the subject matter has never been presented so cohesively. With the viewing of this trailer, and follow up clips, I began to realize that I had been waiting for this film for over three decades. As part of my donation to the film, I will receive a copy of the home video release. Living near Philadelphia, I am lucky to have theaters that play major films right alongside limited releases. But, the closest it would be coming to me was east coast Hollywood, aka New York City. I found out about these showings about a week before opening, and decided the three-hour trip would be well worth it. I purchased my tickets for a screening on June 17th, which included a Q&A with director Matt Schrader and composer Bear McCreary. The morning of the screening, I started my day by watching Schrader and McCreary on CBS This Morning. Film music is going big time! A close friend, BK, agreed to ride with me to the screening. He is a musician and composer, but not a film score fan. I was interested to see what he thought… if we ever arrived. After setting out in the early afternoon, I met him in north Jersey only to be met by the following sequence of events: miss a train, drive to Jersey city only to find no parking, an extremely annoyed parking attendant, and then inexplicably easy street parking for a whopping $.25. A short PATH subway ride later, and we’re at the Quad Cinema in Manhattan. As we entered the theatre, I noticed Matt Schrader in the lobby. I stopped to introduce myself and was immediately greeted by his kind enthusiasm. We only spoke for a moment, but I found myself hoping that his personality would come through in the film. Simply put, Score is a joy to watch. It is engrossing from start to finish – and that’s for fans and non-fans, alike. Both myself and BK were hooked from the first few moments through the final credits. The music is covered from a variety of angles: the process (both macro and micro), the composers, the history, the business, and much more. Schrader and his team have pieced it all together seamlessly. The editing and pacing introduces something new and wonderful almost every ten minutes. The film discusses the early history of film scores, starting with the introduction of Worlitzer organs to accompany the images on screen. It then progresses through the decades leading to the modern world of Hans Zimmer. This chronological framework helps to pace the introduction of major composer interviews. You don't even realize that you haven't heard from Danny Elfman until you see him about an hour into the film. The same can be said for many other major interviews and revelations. Schrader's focus was, for me personally, uncanny. He gives major screen time to the exact composers and practices that have been the center of my lifelong listening. Steiner, Bernstein, Goldsmith, Williams, Elfman, Newman, Zimmer, and more. Yes, Silvestri, Giacchino, and others are absent, but you won't miss them. (Hard to believe, I know... but I really mean it. It took me days to realize that some of them were not in the film.) The production secured an wonderful cast of composers writing in a wide range of styles from an even wider range of backgrounds. Credit must also be given to the team in charge of sound mixing for Score. The music is ALWAYS front and center. As I watched, I remember being thankful for how prominently the musical cues are featured during both interview and archival footage segments. There are a few sections (E.T. and Shawkshank come to mind) where almost entire film sequences are shown with minimal interruption. Those moments allowed the audience to just breathe and enjoy. Score opens with Marco Beltrami's The Homesman.​ The piano is so simple but you immediately realize that the production of that sound was much more complex. It's a perfect introduction to a film that explains the complexities of something so many take for granted. I also deeply appreciate that Schrader did not choose to start the film with Star Wars, Jaws, Indiana Jones, or any other mainstream success. It told me that he understood the depth of music from which he could pull. Patrick Doyle's time on screen is limited, but the few moments that do focus on him are extremely memorable. He is shown playing the Potter Waltz from Harry Potter and the Goblet of Fire. When he finishes, Doyle immediately breaks into a huge smile and fit of laughter, claiming that he hadn't played that piece in years. You can just see how much genuine pride he feels and how much he enjoyed performing it. After the film, Matt Schrader commented on just how energetic and kind Doyle was during the interview. One of the funnier moments centers around Mark Mothersbaugh and his Rugrats theme. While showing off his amazing(ly insane) instrument collection, he tells the story of purchasing a kiddie piano at a pawn-like shop. What he does with the piano after recording the theme got one of the bigger laughs of the night. Original interviews with John Williams are noticeably absent from Score. But, the use of archival footage more than makes up for it. One of the focal points of his segment in the film is the music of E.T. As we are treated to classic video of Speilberg and Williams, psychologist Dr. Siu-Lan Tan discusses the emotional effects that film music can have on an audience. She makes some specifically poignant comments about the movie's finale. It made for an especially touching moment. What are you guys up to? Oh nothing, just creating a standard. Thomas Newman's unique soundscape is given quite a bit of well-deserved screen time. Schrader focuses on The Shawshank Redemption and Finding Nemo scores, both excellent choices. It was a delight to hear other composers discuss the amazing impact Newman has had (especially with his writing for piano) on the film world. Danny Elfman's segment starts with the scene that introduces Edward Scissorhands. Hearing that choir and watching Johnny Depp walk out of the shadows was just wonderful. And again, hearing other composers talk about his impact was beyond enjoyable. I'll wrap this up with another of the more comical moments. After working on a score, Brian Tyler enjoys visiting theaters to watch audience reactions to his music. The way he relates this ritual is light and humorous, and makes for a nice launching point into the film's finale. After the screening, Matt Schrader and Bear McCreary came to the front of the theatre and answered questions. Among other questions, I asked Matt if he was able to ride in Tyler’s Ferrari. The answer was yes. Lucky. Schrader, McCreary and director of photography Kenny Holmes were kind enough stick around for over an hour after the Q&A was complete. It was a pleasure to bend Matt’s ear for more than 20 minutes of this time. He shared many insights into the making of the film, along with some fun anecdotes about the interviews and process. BK, meanwhile, was excited by how much he had enjoyed the night. We hadn't brought anything for them to sign, so he improvised. 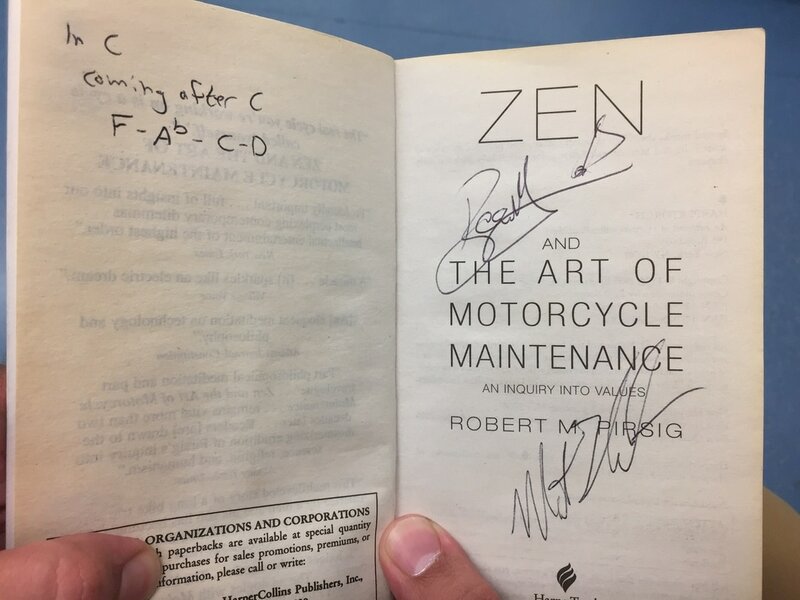 They happily signed a copy of Zen and the Art of Motorcycle Maintenance (written and read by neither of them). He also asked Bear McCreary to name his favorite chord. See the left page of the book. BK can't do anything normal. FilmScoreFans.com: What was the genesis for this film? Why did you make it? Matt Schrader: The thing I love about film scores is that it is music made specifically to evoke strong emotions. With a lot of other music, that’s not really the workflow, but with scores, the whole purpose of the score is to make us feel something. That’s obviously a bit oversimplified, but I think I realized early on how powerful film scores were. The intensity is something I’ve always really loved, and hoped for a documentary to be made some day. After several years passed, I decided it was worth taking a shot at it myself. FSF: What is your music background - who do you listen to? Would you consider film music your favorite or is it a part of your professional life? MS: In another lifetime I might have been a composer. I have some natural musical skills, but one of my regrets is that I never really learned how to play an instrument well. I really admire people who know an instrument so well they can use it organically and as a way to communicate. I still really struggle to put the basics together, but I’m a very active listener of a lot of different types of music. The great thing about film music is you can get a lot of different styles and genres all in the same medium. FSF: If this is your favorite music (and even if not), which scores and/or composers do you consider to be your favorites? MS: I’m partial to some of the more recent and popular film composers like John Williams and Hans Zimmer. What amazes me about them is that they’ve found ways to reinvent and continue to evolve the art form, just like other great artists throughout human history. I like to think of them as two greats that we’re really lucky to be witnessing. These are of course very popular in the film music world as well, but beyond this, I really enjoy Clint Mansell, Howard Shore and Phillip Glass. FSF: What was the most surprising thing you learned about a composer or the film music world in general? MS: There are so many things! For the average moviegoer, there’s not really an understanding of the pressure — both financial and temporal — of a big film project. I continue to be astonished by that moment of discovery film composers often have on a film, and hope that the director will support it. When that spark of an idea is allowed to grow, you get the most amazing music, in my opinion. FSF: Who was your favorite interview, and why? FSF: What can we expect from the companion "interviews" book and dvd listed on the Score website store? MS: We captured so much in every interview we conducted that we really felt bad letting it go to waste. In almost every interview it felt like we were mainlining this intensive musical knowledge and wisdom, and we wanted to cram as much as possible into the documentary (one of the reasons we decided against a narrator, in fact, was to cram more real interviews in). These represent just a fraction of the things we captured on camera, but for those who are interested in it, we wanted to make it available on some format that would be accessible. FSF: While many fans consider this era a Renaissance, some believe music is being "dumbed down" based on the heavy use of synth and non-orchestral influences. Do you have any thoughts on the divide between or mixing of orchestral and synthetic soundscapes? MS: This is a fair criticism, because a lot of music is certainly dumbed down, or derived from something else that people liked. While that’s frustrating for film music fans, I do think that serves a purpose to new audiences. Yes, it’s simple, but in a way it’s starting to build people’s exposure to what music can accomplish. People are smarter than studios sometimes give them credit for, and I think everyone has their own evolving musical interests. At a certain point (for me it was years ago), you start to cringe at the “brahhms" you hear in movie trailers, for instance. I think rehashed music becomes stale, but it is something simple and accessible to new audiences. In the end, music can be a lot of things, and every film score fan has their own guilty pleasures, but through those we start to seek out what new and different and sometimes even revolutionary. FSF: Give us your "State of Film Music" address. Is film music on the rise or decline? MS: Film music is on the rise. Composers are on the rise. Work for new composers is on the rise. We live in a world that is producing more media than ever before, and I think all those fresh faces in the industry bode well for experimentation and the next evolution, whatever it may be. Furthermore, mainstream audiences are going to live concerts of their favorite movies, and Hans Zimmer is taking that to an international rockstar level, and selling out his shows. There’s a lot more interest in this industry than people would have thought even one year ago. The future is very bright. Score: A Film Music Documentary has me thinking one thought - "I have been right all this time." For decades, my dedication to film music has put me on the fringe of the serious music world and the world cinephiles, alike. Watching the interviews in the film, and talking to Matt Schrader and Bear McCreary was one of the most fulfilling moments of my life as a film score fan. They get it. The production team gets it. And now, thanks to their film, audiences everywhere will have the opportunity to understand and become film score fans. On the ride home, I spent the drive introducing a very interested BK to 10 Cloverfield Lane and Battlestar Galactica. Film Score Fans for the win.